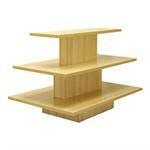 Are you looking for an attractive way to display merchandise in your retail store? 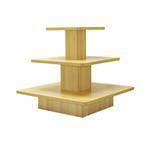 At American Store Fixture, we have everything you need to meet your specific needs. Our selection of retail display tables are the perfect solution for displaying merchandise in an attractive and useful way. Whether looking for nesting tables or a tiered display table, we offer only the best and highest quality retail display tables for your business. With 3 tier square waterfall tables, 3 tier rectangular tables, 3 tier oval tables, knockdown bases, and nesting tables, we have the retail display solutions that will surely help your products get noticed. A tiered display table is perfect for any retail store and can be used to display a plethora of different products from clothing to food items. In addition to the incredible selection of retail display tables found below, we also have an in-house millshop that can product custom display tables to meet your unique and specific specifications. 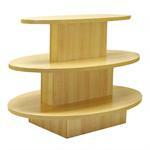 When it comes to custom display tables or stock retail display tables, make AmericanStoreFixture.com your only choice.